From racial slurs and public strip searches to needlessly brutal arrests of juveniles and people who are mentally ill or in crisis – the improper behavior detailed in the U.S. Justice Department report on the Baltimore Police Department paints an ugly picture of an agency with deep systemic problems. The product of more than a year of investigation by the federal government, the report (leaked to the media last night) says the department routinely stopped and frisked residents – disproportionately, the city’s black residents in its poorest neighborhoods – with little or no provocation. 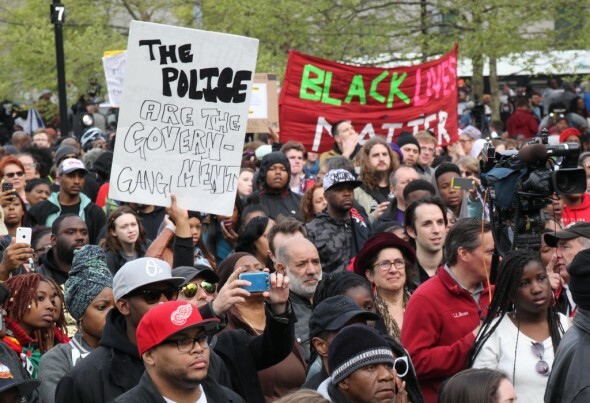 Their findings, general and specific, make the 163-page document a gripping read, even in a city where reporting, protests and civic debate about police excessive use of force by police have been going on for years. 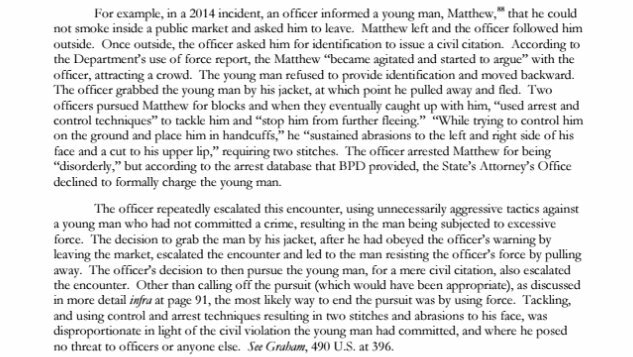 The report describes the case of a black man in his mid-50s who was stopped 30 times in less than four years – none of the stops led to a criminal charge or citation. Since 2010, booking supervisors and prosecutors declined to file charges – after arrests by their own officers – more than 11,000 times, suggesting the magnitude of arrests without probable cause. In 2014 alone, police recorded 124,000 stops, suggesting the early 2000s-era stop-and-frisk tactics, supposedly disavowed, have continued. From 2010-2014, Baltimore Police arrested 650 people for the crime of playing cards or dice. There were 410 individuals stopped at least 10 times over the course of five and a half years of data examined – 95% of them black. Overall the investigators found that agency found that Baltimore Police engage in “a pattern or practice” of discriminatory policing against African-Americans – a finding that will eventually result in a federal consent decree, yet to be negotiated, and an outside monitor, federal officials said. “Statistical evidence shows that the Department intrudes disproportionately upon the lives of African- Americans at every stage of its enforcement activities,” the investigators conclude. Inadequate policies, confusing procedures, failure to hold officers accountable for wrongdoing, discouraging members of the public from filing complaints – the practices that have largely been the subject of complaints highlighted by activists are laid out in the document with federal government imprimatur. 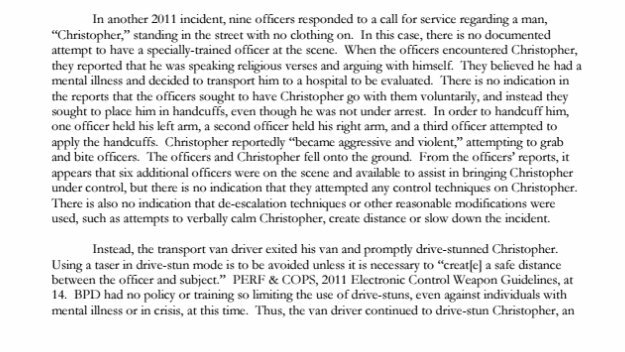 Along with its statistical findings, the report provides multiple anecdotal descriptions of the improper use of force, sometimes-lethal force, when no crime has been committed and there is no threat to officers or others. Volatile situations, many involving sexual assault victims, juveniles or other vulnerable subjects, are escalated by officers instead of defused. 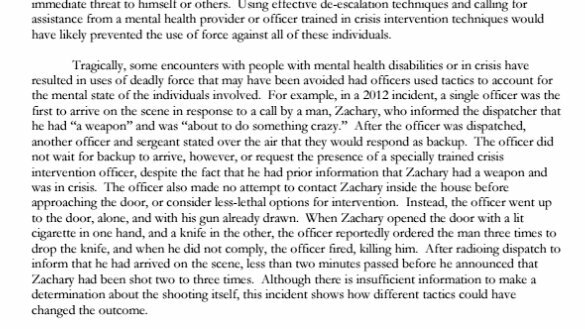 Some 20% of the use of force incidents BPD provided involved mental health disabilities or people in crisis. Also described at length is improper use of Tasers, to deliver painful electric shocks in drive-stun mode, in instances where this extreme measure was not necessary. 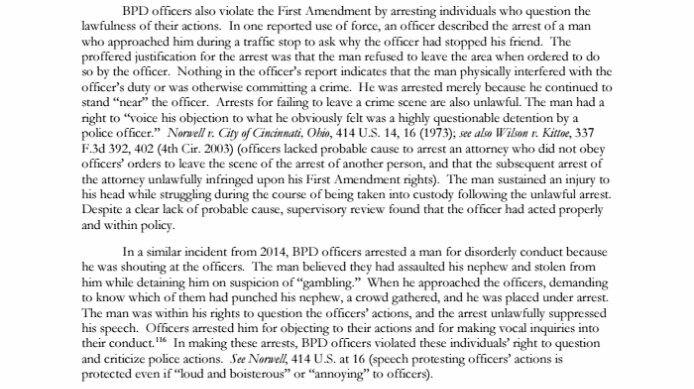 Another group routinely arrested without probable cause, the report found, are individuals expressing their First Amendment rights by questioning the lawfulness of police action.